Question: How do you know how much weight to use when you’re nymphing? This is an age-old question that, unfortunately, has no easy answer. One of the frustrating things about fishing subsurface is that most of the time you can’t see what the hell is going on down there, so you have to guess how your flies are behaving. However, there are ways to make educated guesses that will help you keep your flies in the strike zone longer—and, therefore, catch more fish. 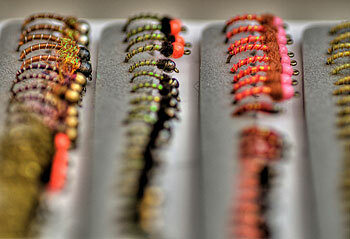 In most angling situations, you want your flies to be close to the bottom, where the vast majority of natural nymphs hang out or get caught in the drift. (There are other angling situations—during a hatch, for example—when you want your nymphs higher in the water column, but let’s stick with the basics for now.) Unfortunately for us, the bottom is rarely a uniform and flat surface, and its character changes from pool to pool and run to run. Furthermore, the ability to get your flies to the bottom will also be affected by the speed of the current and the diameter of your tippet. So rule #1 is be willing to change things up. The nymph rig that presented your flies perfectly at the head of the pool is not going to work as well when you’re fishing the tailout just 50 yards downstream. You’ll need to adjust your rig to deal with the faster current and shallower water. If you adopt a one-size-fits-all attitude toward your nymph rig, you end up with a setup that is not optimal for any one situation. So you must be ready and willing to fiddle with and tweak your setup all day long if you want to achieve the best results. That said, the only way to determine the proper weight for any angling situation is through experimentation. As a general rule, you need just enough weight to get your flies to the bottom relatively quickly and then allow the flies to drift fairly naturally without getting hung up. Too little weight, and the fish never see your flies. Too much weight, and you’re constantly hung up on the bottom. Both result in fewer fish to the net. The only way you are going to determine the right amount of weight is to analyze your drift. You’ll want to be able to fine-tune the amount of weight, so use either very small split-shot or tungsten putty, which you can form around a knot in your leader. Guide and author Ed Engle suggests that a good way to arrive at the correct amount of weight for a given piece of water is by simply adding weight in increments until your fly hangs up on the bottom and then removing just a little bit. So, let’s say you’re standing at the head of a slot that runs against the far bank and looks to be about four feet deep. You set up your rig with, say, a Beadhead Prince Nymph with a Pheasant Tail Nymph dropper. The beadhead pattern will help get your rig to the bottom, but start with a little more weight, placed a foot up the leader. If you make four casts without ever feeling the flies tick the bottom, you need more weight. Add more putty or a couple small split shot. Repeat the process until you hang up on almost every cast. Then cut back on the weight a tiny bit. You should now be dialed in, and this setup is your starting point for any similar runs you fish in the future. Of course, you’ll need to repeat this process of experimenting for every new piece of water you fish. Through experience, however, you’ll learn how much weight you need for each situation, and the process of dialing-in your rig will grow ever shorter. Aside from adding weight, you can also get your flies closer to the bottom by casting farther upstream—which gives the flies more time to sink before they get to the trout lie you’re trying to fish—or by switching to a lighter tippet. But the more you fish with nymphs, the more you’ll learn about how to get your flies where they need to be. And remember: if you think you don’t have enough weight, you probably don’t.